Muhammad Younis. Picture by RTE. 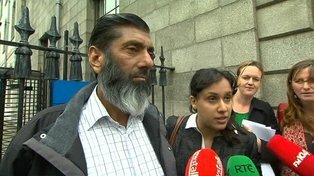 In a very important decision yesterday, Hussein v The Labour Court  IEHC 364, Hogan J. found that a migrant worker (Mr Muhammad Younis) who had been exploited by his employer could not claim under the working time legislation, minimum wage legislation and the Terms of Employment (Information) legislation. See news reports at Irish Times and RTE websites. Liam Thornton has an excellent post over at humanrights.ie summarising the issues, particularly focusing on the international human rights dimension of the case. Hogan J. says at para. 19 that the Employment Permits Act 2003 contains no saving clause such as obtains in the case of unfair dismissals. However, the National Minimum Wage Act 2000 does contain a saving clause at s.40. While it is likely that even if he had referred to this section, he would have reached the same conclusion, it is surprising that he does not explicitly address it. Hogan J. does not refer explicitly to the significant Irish employment law case of Lewis v Squash Ireland  ILRM 363. In that case, the Tribunal stated: "It is public policy that the Courts and this Tribunal should not lend themselves to the enforcement of contracts, either illegal on their face or in which the intended performance of obligations thereunder was illegal to the knowledge of the party seeking to enforce the contract" (emphasis added). Hogan J. could have explored whether he agreed with such a statement of public policy by the EAT, rather than relying entirely on court decisions. While of course the courts have superior authority to the tribunals, they have also recognised the specialist expertise of such tribunals in the past. Hogan J. also does not refer to Dubyna v Hourican Hygiene (2005) UD 781/2004, another EAT case in which it was found that a contract in breach of the Employment Permits Act 2003 was enforceable where the employee was unaware of the breach. Admittedly, the circumstances were quite different but nonetheless it is a more relevant decision than some of those cited in the High Court decision. I am not entirely comfortable with the idea of the High Court posting copies of its decisions to the Ceann Comhairle, the Cathaoirleach of the Seanad and the Minister for Jobs, Enterprise and Innovation. I agree that a judge may highlight a possible anomaly in the law, or possible unintended consequences of legislation, and even state that the law should be changed (as happened in the X. case). But it is unnecessary and perhaps could be misinterpreted for the judge to post the decision to these three people. They are all surely aware of the decision, as they are aware of all court decisions. Perhaps I am splitting hairs here?